When many Northern Forest Canoe Trail Paddlers think of the Saranac River, images of hand-operated locks, many bridges, and wide-open marshlands come to mind. While these are quintessential aspects of this river, they don’t offer a complete picture. The Saranac River has some of the most challenging rapids along the Northern Forest Canoe Trail. 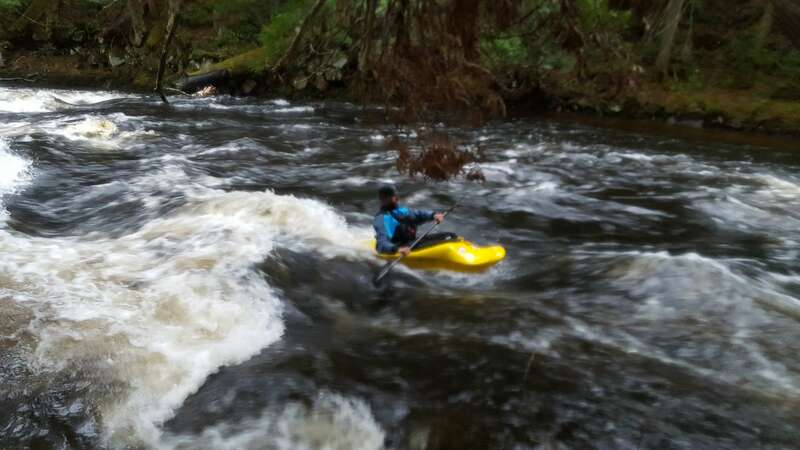 For the whitewater enthusiast, this can be one of the most exciting aspects of the route, especially in early spring when water levels are high. Below is a summary of one portion of whitewater, the section from Permanent Rapids to Clayburg. Permanent Rapids is the first significant stretch of whitewater on the Saranac River. This 1.2-mile portion of class II-III rapids is located in Bloomingdale, about 10 miles outside the village of Saranac Lake. This stretch has an obvious portage along the road that is used by many paddlers who are not familiar with running whitewater. However, if you have the proper skills, boat, and equipment, these rapids are certainly fun to paddle. Generally, this stretch is paddled by experienced local kayakers in April and May after the spring freshet when the water is highest and often at a Class III level. Once the water starts going down – toward the end of May and into June – this section becomes Class II water that is attempted by a wider range of paddlers, including some thru-paddlers. The most challenging portion of this section is “The Narrows,” a brief narrowing of the river with a sheer rock wall on river left and a steep embankment on river right. In water levels above 2,000 cubic feet per second (cfs), you’ll experience an exciting wave train in this location. The next section of rapids on the Saranac River, immediately below Union Falls Dam, is paddled by very few people, mainly due to low water levels in the summer and the technical nature of its non-stop features during spring freshet. Though short, this stretch is sure to give you a run for your money due to irregular waves and river-wide holes. It would certainly thrill the local whitewater community to have a stretch of whitewater similar to this that could run throughout the paddling season. Trail Rapids can be found after paddling a few miles of flatwater below the power station and dam. During higher flows, this section is simply swift water and rolling waves, as many of the features become washed out. Although some paddlers have taken this section for granted, each portion of this approximately mile-long stretch of rapids – broken up by some flatwater – should be approached with caution. In the summer months, many large rocks lie just below the water’s surface, making it a technical boulder garden. Due to the remoteness of this stretch of river, capsizing here can have more consequences than other stretches along the river that run beside state Route 3, a well used road. One important thing to keep in mind when paddling Trail Rapids is that the Casey Road Portage is near the end of it on river left. Though marked as clearly as possible, this portage is still easy to miss if you are not paying attention, as it begins in a small bay with swiftwater both upstream and down. Be sure to take out here if you are not comfortable paddling the class III+ and IV rapids that lie a few miles below Silver Lake Road bridge. At the end of Trail Rapids you will paddle under Silver Lake Road bridge and into a very challenging section of the Saranac River. After passing some small houses on river right and left, you will arrive at Teft Pond Falls, a solid class IV waterfall that should only be run by expert whitewater boaters with proper equipment. The land on either side is private and posted, so scouting becomes challenging without permission. Be aware that this waterfall is split in two by a large island immediately below the falls. The left channel is quite friendly in proper levels, and makes for an exciting 10 foot sliding drop with a soft landing for expert whitewater paddlers. The right line, however, has been choked with wood for several years. It would take another Tropical Storm Irene or some serious and dangerous chainsaw work to make this side safely runnable. Paddlers can avoid Teft Pond Falls by portaging to the left on the unmaintained trail. Once beyond Teft Pond Falls, the river remains a playful class II+ to III, with more technical maneuvering required at lower levels due to the large number of rocks here. From here to Clayburg, there are only two significant river features of note. One is shortly after Teft Pond Falls, and consists of a short ledge with a decent hole on the bottom. This ledge appears as a horizon line until you’re just about on top of it. Scouting here is once again only possible on private land and is further complicated by large log jams on either side of the river. Immediately after this drop lie several large holes, especially at levels above 6 feet. I’ve personally taken a shin-banging swim here after effectively navigating everything upstream, so remain vigilant regardless of your skill or previous success. The other river feature of note lies much closer to Clayburg. There are two possible options for running it, both of which are sliding-style ledges. River left is the easiest and most frequently run line, though river right can be exciting at higher levels. The two lines converge into a beautiful standing wave. In levels above 6 feet, this wave is ideal for surfing, and looks almost artificial due to its perfect shape. Scouting here remains on private land, though no posted signs currently exist. Following this last drop the river continues with class II to II+ rapids most of the way to Clayburg. The takeout is on river left, just upstream from the confluence with the North Branch. Follow the small herd path uphill and back up to the road, and celebrate a successful run with your beverage of choice. If you need any food or drinks, Maplefields lies just down the road on Route 3, and offers a great variety of munchies, baked goods, and drink options. It should be stressed that the portion of river from the Casey Road Portage (in the middle of Trail Rapids) to the Clayburg takeout is challenging, and I highly recommend that you refrain from attempting any portion of it with a loaded boat, or any craft that is not designed for whitewater and properly outfitted. Furthermore, this section is best run on levels above 4.5 feet (1400 cfs), with levels over 6 feet being the most fun. Many paddlers have damaged, lost, or destroyed their boats along this stretch. Be safe.